Customer engagement is seamless when agents focus exclusively on the customer and not the myriad of systems needed to access information. The simpler, the better. 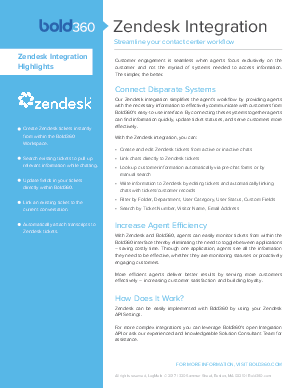 Our Zendesk integration simplifies the agent’s workflow by providing agents with the necessary information to effectively communicate with customers from Bold360’s easy-to-use interface. By connecting these systems together agents can find information quickly, update ticket statuses, and serve customers more effectively.